- Click on the Nimbus Capture menu icon. Then you will be able to select the required screen fragment to make a screenshot of. - Open Main Menu (right-click on the Nimbus Capture icon in Tray Menu), and select Snapshot. You will then be able to select your desired type of screenshot. - Use hotkeys (customizable in the app settings). Can I edit a file from a PC? Yes, you can. Press on Open Editor (right-click on Nimbus Capture in the tray menu). Click on Open File. You will then be able to edit the picture as a regular screenshot. Can I automatically save a screenshot once it's been made (without editing)? Yes, you need to open Settings (right-click on Nimbus Capture in tray menu) and select required action in After Capture. - Open Main Menu (right-click on the Nimbus Capture icon in Tray Menu), and select Videocast. You will then be able to select the mode you want (e.g. to record actions from the entire screen or from only a fragment of the screen). 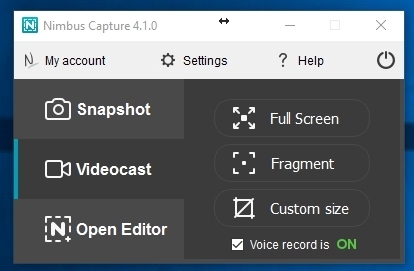 - Right-click on the Nimbus Capture icon in Tray Menu and select Record Full Screen or Record Fragment depending on what you want to record. Once you’ve selected the desired mode, the screen cast will start recording and the Nimbus Capture icon will change its color. 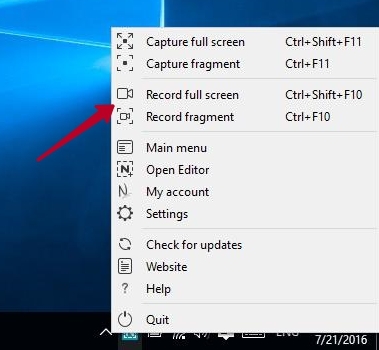 You can stop the recording by simply clicking on the Nimbus Capture icon in Tray Menu (or use hotkey ctrl+9). If you need to pause recording, use hotkey CTRL+8 (alternatively, you can right-click on the tray menu icon and select Pause Recording). You can then continue recording by pressing CTRL+8 again (or right-clicking on the tray menu icon and selecting Resume Recording). 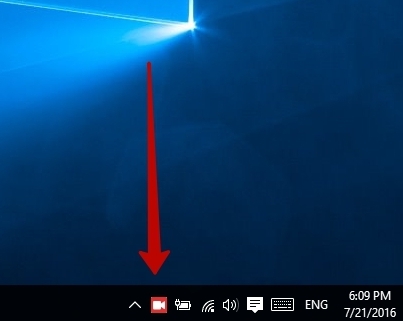 You can save the video to your computer (1) or send it to Nimbus Note (2). To send to Nimbus Note, you need to click the Upload to Nimbus Note button. If you are already logged into your Nimbus account, the video will begin uploading, after which you will receive a direct link to your note. If you don’t have an account in Nimbus, you can create a new account with the My Account button (or My Account in Tray Menu). You will also soon be able to make video screenshots (3). 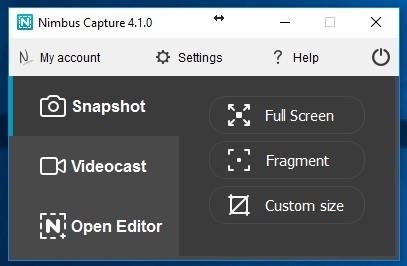 Can I make a video instead of a screenshot by clicking on the Nimbus Capture icon in the tray menu? Yes, you need to open Settings (right-click on Nimbus Capture in tray menu) and select required action in After clicking tray icon. How to disable sound when recording a video? Open Settings (right-click on Nimbus Capture in tray menu) and go to Sound. Here you can change any sound settings you need. How can i crop or trim video?